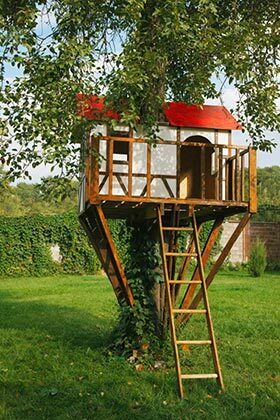 This past week, after months of listening to my children beg, I finally caved in and allowed them to build a tree house in our backyard. Of course, it had to be under my terms and my rules, to which they gladly agreed. My husband and I, along with our four children, sat down and began making plans. Each of us weighed in on our requests and so we etched out a design and plan including the materials needed the location as well as safety requirements. The planning process was quite fun as each of us had something unique to add. The goal was to use as much recycled products as possible. So during the weekend we looked online and combed the local warehouses for discarded wood pallets, crates, and other useful materials we could find. The kids loved the hunt and our backyard looked like a junkyard with the mishmash of materials we had found. Other than screws and paint, there was very little we had to buy. Since it was summertime and the kids were off from school, they wanted to start right away. We started on a Saturday morning and still hadn’t finished after working straight through the weekend. We continued to work through the week, minus my husband who had to work. But I took off a few days to try to complete the project. We were sawing, banging, drilling and painting away when I heard a persistent and unrelenting ring at the doorbell. We must have not heard the bell for a while because the ringing was long and came in rapid succession. I opened the door all dirty and disheveled, wearing my torn work clothes. A tall gray-haired man with a moustache, wearing khakis and a blue polo shirt with an identification badge in a clear-plastic holder hanging from his pocket smoothly extended his right hand to shake mine while handing me his business card with his left. All in one swift motion, like I was receiving a diploma. “Hi, I’m Gary Carzo with the —– ——- (name of city) Department of Building and Safety.” I reluctantly (because my hands were dirty) shook his hand from behind the door and responded, “Okay, how can I help you?” He opened up his leather notepad, which was tucked under his arm and said, “I need to come in and inspect. I’m responding to a complaint of unlicensed workers on the premises and unpermitted additions to your home.” He could tell that I was in shock as I didn’t respond right away. After what seemed like forever (probably only 30 seconds or so) I removed the chain from the door and ushered him in. I took him to the backyard where my kids had decided to take a break (because I had stopped) and of course to eavesdrop on our conversation. “Here it is.” I said pointing to the tree house and my children. “That’s the addition up there in the tree and those are the workers. You can take whichever one of them you want,” I said with biting sarcasm. He could tell I was NOT happy! It turned out that Gary was pretty cool and dealt with the situation pretty well though I was hounding him to give up the name of who had called. He kept reiterating that he could not disclose this confidential information but added that he would clear the complaint once he got back to his office. “We get numerous complaints from ‘anonymous’ neighbors throughout the city on a daily basis,” he added. “Some are legit and some are bogus,” as he checked out the tree house to make sure that it was not a permanent structure and then took off after giving us some helpful safety tips. I was still seething as I took in a 360 panorama of my backyard wondering which of my neighbors was the culprit. I had some idea about a jealous and whiney neighbor who lives two doors down that had previously complained about my kids riding up and down his driveway with their bikes. But I couldn’t be too sure. Besides, what good would it do me at this point, anyway? What I was sure of is that it ruined our mood for the rest of that day as we walked around lackadaisically cleaning up odds and ends. We decided to resume work the next morning. I waited for my husband to get home so that I could vent. My concerns were simple and I allowed my kids to listen in as I wanted to use this as an opportunity for them to learn. Otherwise, my frustrations would have been in vain. My complaints – Firstly, if I’m doing something wrong (which I should not be) then I would accept any punishment that comes along with it. Secondly (and my biggest gripe), is that if someone has a problem with me or something that I’m doing then come on over and ask me directly. And finally, the Building and Safety Department representative that came out to investigate simply had a job to do and it would not have been fair for me to take out my frustrations out on him. We eventually finished our tree house and had a great time bonding during the project but definitely had some unexpected and somewhat painful lessons learned!